During the summer of 1857, Indian rebel soldiers from the British Army attempted to overthrow the British hold on India and reinstall Mughal rule. For five months, rebels seized Delhi and declared the aged Mughal noble, Bahadur Shah Zafar, Emperor of India. Referred to as the 1857 Mutiny by British rulers and as the First War of Independence by enthusiastic nationalists, few events in Indian history incite more passion than the 1857 seige of Delhi. 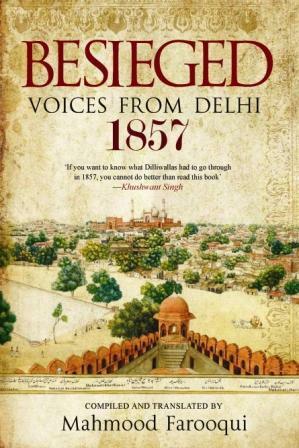 In Besieged: Voices from Delhi 1857, Mahmood Farooqui draws on more than ten thousand Urdu and Persian documents processed by the rebel administration and later used by the British as evidence in Bahadur Shah Zafar’s trial. As Farooqui notes in the introduction, despite the widespread availability of histories, memoires, and essays on the 1857 uprising, we know much about the British experience and remarkably little about what went on within the walls of the seized city. The documents in this collection show how the rebel government administered the city and how the uprising affected ordinary people. One man asks the rebel government to release his dhobie (washerman) from prison because the dhobie has all the man’s clothing and he has nothing left to wear. A widow asks for financial compensation because rebel soldiers killed her husband and stole all her belongings. Farooqui presents grievances from soldiers who had not been paid, letters from ordinary citizens complaining about harassment by rebel soldiers, documents describing elopements, evictions, burglaries, bail proceedings, gambling, and counterfeit currency. Food was scarce and looting widespread. The city’s sanitation system broke-down and corpses and animal carcasses lay on the streets untouched for months. The documents recount “the unsung, the ordinary, and the unheroic” of 1857. The papers collected in that archive and presented in this book serve to record a time of turmoil and provide a bird’s eye view of everyday life during a very complicated and multifaceted event.